Psalm 25:5-6 5Lead me in your truth, and teach me, for you are the God of my salvation; for you I wait all day long. 6Be mindful of your mercy, O Lord, and of your steadfast love, for they have been from of old. Awhile back a friend asked me what was my favorite scripture and without hesitation I said Micah 6:8 “He has told you, O mortal, what is good; and what does the Lord require of you but to do justice, and to love kindness, and to walk humbly with your God?” Then she asked the question … Why? I had to think about that for awhile. I could have said that it was how my Father ended all of our dinner prayers and hearing it always brings back wonderful memories. Or, I might have told her my Disciples tradition has based its mission and vision statement on it and those statements have opened the door to a witness in social justice and peace in the greater world. But while each of those reasons are truth the real reason is this one verse from Hebrew scripture gives me Hope. In our world today hope seems to be too little and too late. We watch the news and it’s filled with killing, greed, anger, hate, and very little that would give us hope for a better world. Killing, whether of the body or spirit, disrupts God’s purpose for our lives. To kill a human being made in the divine image is to subvert our lives which were purposely created to be lived in mutuality, support and respect, to live in right relationship with each other, God, and creation. Killing for greed, hate, and anger is to kill a little of ourselves and build a wall, brick by terrible brick, between us and God. So what does the word “Hope” mean for us then? Those who define words say it is to expect with confidence. For others it means to expect things will get better, not only to get us through the difficult times in our lives, but also for our world, we will have a place of peace and justice for all creation, not tomorrow, or sometime in the far future but NOW, today. We in all of our faith communities across the globe are called to seek justice, offer kindness, and be examples of living in peace to the world, to be a living hope. God promised the descendants of Noah, and all creation that God would no longer destroy the world. As a covenantal symbol of God’s own self-limiting, God’s disarmament, God placed a rainbow in the sky. In Noah’s time bows were symbols of violence just as guns are for us today. So God laid down his weapon of mass destruction and placed it in the sky and said ‘I will no longer destroy what I have created.’ I wonder what God would place in the sky today, a nuclear bomb maybe? Don’t get me wrong, I haven’t forgotten all of the killing done in the name of God in Scripture. And, I must admit I have difficulty with the genocidal practices of Joshua when the Israelites crossed the Jordan River into the Promised Land. But I also know that just because a practice is in the Bible doesn’t make it an acceptable practice for today. And, that is the reason I so firmly believe in God’s promises of hope. You see God’s covenant of the rainbow means that we, you and I, all humans, are in a covenantal relationship with God, each other, and creation and that means that all life matters, my life, your life, white, black, yellow and brown life, furred and feathered life and (much to my discomfort) insect and spider life. The Psalmist makes a claim of hope and trust in God and tells us that God’s protection flows from the mouths of those who have no hope or trust in systems of violence, injustice, and oppression. Not just overt physical acts of injustice but injustice and violence and oppression brought about by attitudes, social structures, and any other “isms” that threatens the peace and justice of God’s Kingdom. God’s rainbow of hope spoken in the Good News of the Gospels goes beyond a “me-centered” interpretation of the world. God’s hope reaches out across our selfish desires to those who need hope, justice, and mercy. Where do you find God’s hope? It is placed where there is justice and peace and there you will find Kingdom of God. Jesus preached the Good News of hope. Hopeful news that leads not only to the salvation of those who accept the gift freely given, but is also the promise of something more, a new and different life for those who are the most victimized. All faith communities are called to be participants in our own salvation by working for justice, now, in the context of our present world, thereby helping to bring the good news to those who need it, where ever and whenever it is needed. We as believing members of our faith communities are to point the way to the kingdom breaking into our world right now. The kingdom of God isn’t a future event it is happening right now. Every time we offer a helping hand to someone who is hungry, or cold, or afraid the door to God’s Kingdom opens just a bit more. Every time we stand up to those who would harm one of God’s children, the kingdom shines a bit brighter. Every time we stand between victims of injustice and the perpetrators God let’s a little more light out of the door. Every time we speak out when we see an injustice God smiles and sends another rainbow. You know the Irish tell us that there is gold at the end of the rainbow, and I believe that is true. Because I believe that God’s kingdom is that golden treasure and we are to seek it just as the man who sought out the pearl of great price. What could be more beautiful than walking across the rainbow into the Golden Kingdom? Yes, on the first Sunday in Lent, all of the Lectionary scriptures are about hope. Whether you read Genesis, Psalm 25, 1 Peter, or Mark each of them has an element of hope for dark times, in a dark world. Each one offers a ray of light to bring us out of darkness. The light calls us, bright and shinning, multicolored, and golden with hope and promise. 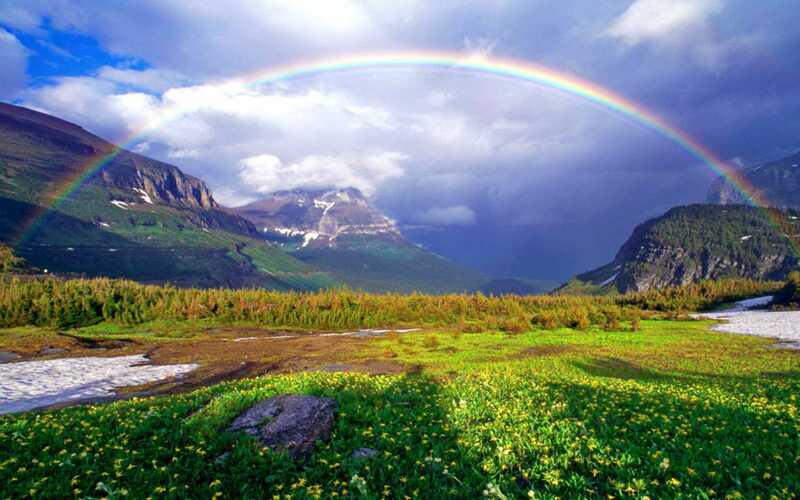 God first gave the rainbow as a promise that She would never forget any of her children. The Psalmist tells us that God will always be there to sustain us. And, Jesus, rekindled the hope in the hopeless that a better life was there for them. Jesus reminds all of us that God will sustain us as we work to be the witness’ against injustice, violence and oppression. God said, “When the bow is in the clouds, I will see it and remember the everlasting covenant between God and every living creature of all flesh that is on the earth.” How does Micah fit into this, well Micah reminds us which path we are to take, “what does the Lord require of you but to do justice, and to love kindness, and to walk humbly with your God?” We are called to be living communities of hope, of God’s promise in every moment of our individual and communal lives.